The Geophysical Institute and constructed this rocket from salvaged pieces and parts from their rocket program. 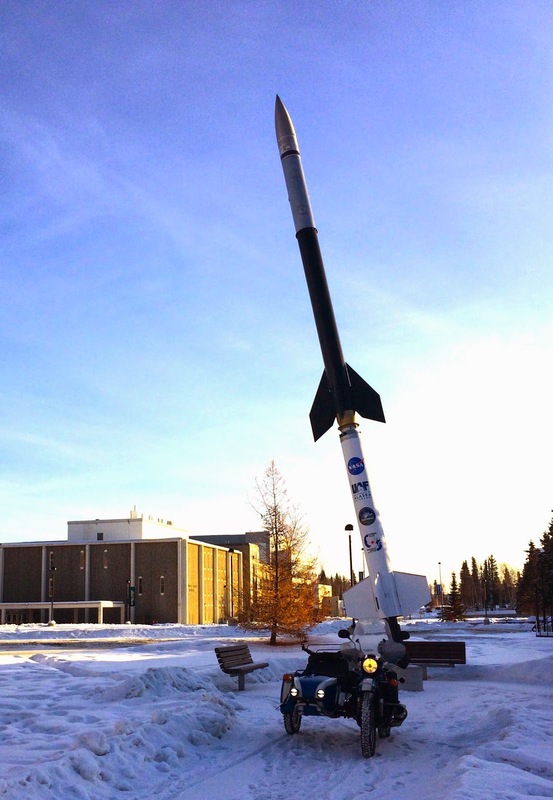 The University of Alaska Fairbanks is, I believe, the only university that has a rocket launch facility. It is about thirty miles north of Fairbanks. It is used to launch sub-orbital experiments in support of auroral and possibly atmospheric research. The display was under construction last summer but I hadn't stopped by and taken a photo of it yet. This is the tail bag that I had selected to review from Motorcycle House back in the middle of November. I did an initial review at that time and said that I would do a followup after using it for a while. I've used it every day that I've ridden since then and that has been just about every day. I am still using the bungee cords attached to the bottom of the bag to attach it to the pillion hand holds below the seat and that seems to be working out alright. Still not as convenient as a top box or some other fixed luggage. I still plan on replacing the bungee cords with some nylon webbing and quick release buckles for quicker and more secure attachment. So far, I've only forgotten to attach the bungee cords once. Fortunately, the bag didn't fall off on the road. It isn't quite as convenient as a tank bag but it makes up for that in storage space. I haven't needed the extra storage provided by expanding the sides out just on my commutes. After all, if it doesn't fit, it just gets thrown in the sidecar. When I get to my office, I just unhook the bungee hooks and carry it into my office. The handle makes it much easier to carry than my tank bag. It holds quite a bit and the one thing that I would add would be a ring or clip to carry keys. For now, a carabiner on a zipper pull works well enough but I suspect that long term, the zipper pull will fall off. It holds my laptop in a padded case, the GoPro camera and all of it's assorted pieces in the blue neoprene bag, lunch and Micro-Start XP-3 battery which I'll cover in a bit. In the small side pockets I carry things like tire pressure gauge, multitools and paperwork. In the upper pockets are the Skidoo face mask filters and rubber tubes, and some other bits and pieces that would easily get lost in the Ural trunk. And, if I need to run an errand the bag comes off easily enough to lock in the Ural trunk if I didn't feel like carrying it around. This is the Micro-Start XP-3 battery that I had mentioned. It's one of those "almost too good to be true" items. I had heard about these but had a hard time believing the claims until I read a post by some skeptical folks that I knew on AdvRider. This bag holds a small (10.2 oz) Li-ion battery that has enough current output and capacity to jump start a car. The case holds the battery, wall and car chargers, jumper cables and a USB dongle so you can use it to charge your electronic gadgets. After charging it up using the small wall wart rated at only 1 amp @ 12v, I took it out to the garage, disconnected the battery from the BMW which is now conveniently in the sidecar. And connected this tiny battery up using the supplied cables. It started the bike repeatedly as in start the bike then immediately shut it down, repeat. After 10 times, it would still spin the starter easily and start the bike. Good enough to convince me. The unit is rated at 200 amps with a peak of 400 amps. Not too bad from a package that barely weighs over a pound. After this test it took quite a while to recharge. This is the second smallest of five models and has found a home in my tool bag. How about that, a post with no videos! Mid-morning on Tuesday, we started to get some large snowflakes. It seemed like a good time for another short video and I needed to pick up an air filter for the Ural. The last couple of days, the idle speed would be lower than usual after the engine warms up. And the exhaust smelled like it was running really rich. This is just a short video of the ride with the large snowflakes. The doubled the speed of the video to shorten it. Riding in the falling snow is really relaxing. The fresh snow dampens sounds including the sound of the engine and exhaust. I'm not using the GoPro recorded audio due to clicking from something loose on the camera mount. It was gone for a while but now it's back again. Wednesday morning - Things are getting back to normal here as far as weather is concerned. 10°F this morning which meant that the heated liner was used again. ChrisL from everydayriding.org had mentioned that he has been using a Napa 2373 air filter in his Ural so I picked one up at the local Napa store and installed it yesterday evening. There was a lot of oil on the air cleaner housing including near the air intake so I suspect that the filter had picked up some oil and when it was snowing, it would clog. The temperature on Monday was once again floating above freezing with predictions of doom and gloom from the weather types. In fact, school was cancelled and the university allowed employees to use a sick day as there was not yet a category for "administrative leave". Most areas have "snow days" but we have the inverse. No problem with snow but major problems with rain. Since I didn't think the roads were that bad, I went ahead and rode in. There was a lot of side to side movement of the rig as it went down the road but that was due to the grooves the road grader had cut into the surface of the ice rather than slipping. It kind of felt like you were crossing a metal grate bridge. Right now, the predicted snow has finally arrived. Fresh snow on top of ice. Should be a good day tomorrow. 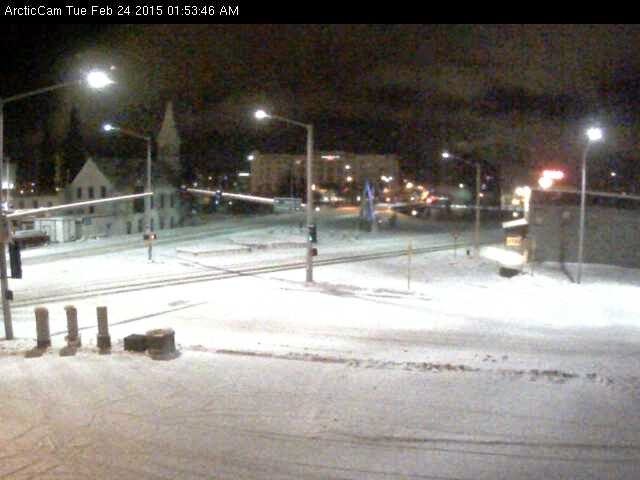 Here is a image capture from the ArcticCam looking south towards downtown Fairbanks. I was curious as to how much snow fell on Monday evening. It looks like maybe only a couple of inches. But by morning, things were looking pretty dreary again. A thick blanket of fog.The second short video is the beginning of the morning commute but the lens was pretty wet after a short distance. Today was unseasonably warm again and that means that there is a lot of frost on the road surface from the road being colder than the air. To make matters worse, there is even talk of freezing rain. I had a number of errands to run and went back and forth across town a couple of times starting at College Coffeehouse. This picture is from the nice lounge area at the credit union. You can even use their free wi-fi as you sit in front of the fireplace enjoying their free coffee. The warm weather is supposed to continue for the next week or so making the roads kind of treacherous. The studded, skinny tires on the Ural don't seem to have any problem with these conditions but you can see tracks all over the road where cars and trucks had ended up in the ditch. I spent a little time on Saturday evening doing some piddly things with the Ural. All winter, I haven't been able to reset the trip odometer as the reset knob was extremely difficult to turn when cold. The knob used to be to the right of the speedometer behind the windshield. This meant the cable had to make a "U" to get into the back of the speedometer. I drilled a new hole on the right headlight bracket and repositioned the reset knob there. Much easier to reach and now the cable only makes a 90° turn. I'll put a waterproof pushbutton switch in the existing hole to enable a 4-way flasher. To power the GoPro and recharge electronics, I had picked up a water-resistant dual USB outlet. It is only water-resistant when the cover is closed. For now, I just wired the dual outlet to a SAE connector until I figure out where to mount the outlet. For now, the outlet can just sit on the seat. It's still dark for the morning commute with sunrise around 8:30 but he color on the south eastern horizon is looking pretty nice. This is just a short video looking towards the horizon. While the eastern half of the country is seeing record low temperatures and mountains of snow, we have record warm temperatures. On Tuesday, it even ventured above 0°F for a bit. On Tuesday evening, the aurora was practically horizon to horizon on my ride to the university to pick up my middle son. I don't think he likes riding in the sidecar no matter what the temperature. I did not have a camera so here is a photo featured in the Fairbanks Daily News Miner. Dean Ojala Sr. captured this image of the Alaska Rail Road back hauling empty coal cars from Eielson Air Force Base with the northern lights in the background Feb 17, 2015, in the Chena flood control area. The final stats for the PBC are in and finished in the top of six of the categories. I'm not sure that I will do it again next year though it was an incentive to get out on the rigs everyday that I was home. I also missed the first three weeks. I'm not sure but I may be a little gun shy right now after the lifter issue with the Ural. I'm not sure I want to take it on a trip where I would be out of cell phone coverage. I was originally considering a winter trip up to the Yukon River bridge but no coverage over 90% of the 300 mile round trip. I wonder what it'll take to get regain confidence in the rig? The project of the day is to try and clean my riding gear. The frozen crankcase vent caused some oil leaks and has made quite a mess. At first, I was somewhat reluctant to get the hi-viz material when I picked up the Roadcrafter Light last year. One of the reasons was that it may really show the road grime. Well, it does. This is the before photo. The last day that videos can be submitted to the Polar Bear Challenge (PBC) is today, February 15, 2015. Most of the other participants are encountering either record snowfall or unseasonably warm temperatures. We have neither. Our temperatures are still around 0°F as would be expected and not a whole lot of snowfall. But that may change this week if the weather guessers are right. PBC video #49 was recorded last Thursday afternoon on my commute home from the university. I headed back out to Goldstream Valley which is the next drainage north of the Tanana Valley. The last video is PBC #50. That's a whole lot more video than I ever intended to upload. This was a night ride also from last Thursday. The intent was to just fill up the tank but I think I ended up burning through almost half a tank just on the way home. Most of it was on highways as the smaller roads aren't as well lit so more risk from moose and other critters. The GoPro batteries don't seem to last very long at low temperatures. At least that has been my experience while making the Polar Bear Challenge (PBC) videos. Depending on the temperature, they last as little as 10 minutes. The wireless remote isn't much better. There are several solutions available including an auxiliary battery pack that fits onto the back of the camera ($36). But I like the idea of just powering the camera off of the bike and not using batteries at all. One of the simplest solutions is to just cut an opening in the housing and plug in a mini-USB cable. I really didn't want to drill a hole in my waterproof housing but a quick Amazon search brought up other options. The one I went is is picking up an off-brand housing for the GoPro 3 (I have the 3+). The housing is larger but is ⅓ of the price. There were some comments about it not being completely waterproof but since I was planning on drilling a hole in it, not really a problem. It took a short time to cut a small opening in the side of the case and remove some of the rubber from an extra USB cable. Now, not only can I power the camera from the cable, I can download videos without taking the camera out of the housing. I still have the original housing for those times I really do need it. I plan to inject some silicone sealant between the USB plug and the plastic housing for just a little more weatherproofing. I still need to install the weatherproof, dual USB socket in the sidecar. That I picked it up in the middle of November. Part of the delay is trying to come up with a little dashboard or something in the sidecar to mount it. PBC #47 was made on Tuesday afternoon during my trip back home. I circled around the north side of town and cut back through to go by the university before heading home. Not the most direct route as I passed by our street on the way. PBC #48 was made on Wednesday afternoon. It was overcast and looking like it was ready to snow at any minute. Instead of moving the Arctic Cat handlebar mitts back to the Ural, I picked up a set of Koplin Geartector Mitts from the local Sportsman's Warehouse. About $3 more than Amazon but there are some advantages to picking them up locally. They are a cheap version of Hippo Hands which I hear are no longer produced. A small hole needed to be cut for the mirror stalks and that probably needs to be reworked a bit. If you push your hand in quickly, the Gerbing connector hits the mitts and causes them to push the high/low beam switch or the BRS (Big Red Switch) when you least expect it. I now put my right hand in slowly and check the high beam light often. They are a lot warmer than the Arctic Cat versions that I've used in the past and I don't even need the heated gloves at -30°F. Grip heaters get turned down as well. Finally, our cold spell may be over. This morning, it was -33°F but I rode in anyway since I forgot to plug in the truck. By mid-morning, I needed to run some errands and it was up to -22°F. By the time 4:00 came around, it was only -7°F. Quite a bit warmer. Two more PBC videos were recorded today. One on the mid-morning ride and the other on the way home. I think I'll hit fifty videos by the ending date of 02/15/2015. Quite a few more than I had intended to record. PBC #44 is the commute in. Sort of. After all, the most direct route between two points when riding is a loop, right? I really like the color of the sky on these clear, cold mornings. PBC #45 is a mid-day ride. It really is nice to be able to enjoy these clear weather days. A sidecar rig really is practical for daily transportation. One of the benefits of these PBC rides is insuring that the engine gets warmed up thoroughly. PBC #46 is the mid-day ride from Tuesday. I had to pick something up and it was clear and a whole lot warmer than it was when I rode in. A good reason for another ride. On Saturday morning, I quickly made yet another PBC video. A very short one since I really didn't feel like riding the BMW as the heated grips have stopped working. I stopped at Ballaine Lake to record the PBC start temperature and mileage and the thermometer said that it was -36°F. I then headed in to see what the university temperature sign said and there were several people there taking pictures. A popular thing to do whenever it gets down to -40°F. The sign said -41°F and it is captured on the video. When I came home, it looks like someone had been playing with bubbles. 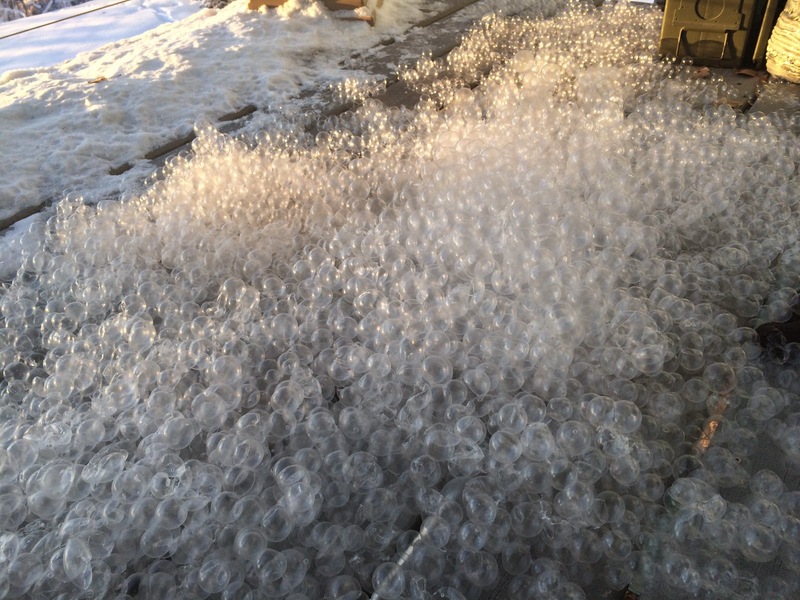 At these temperatures, the bubbles freeze into nice little spheres. Pretty cool, eh! The afternoon project was to reassemble the Ural. Installing the lifters, pushrods, cylinders, heads, rocker arms, torquing the heads, adjusting the valves, etc. was the easy part. Getting the sidecar back on took hours. It's proving to be very difficult to get it back to the alignment marks that I made while taking things apart. I had mentioned to Mickey that the valve covers leaked a lot of oil so he added a couple of gaskets to the shipment, no charge! By 9:00pm it was back together, oil and filter changed, no leftover hardware, it started right up. No funny noises, no leaks. On Sunday afternoon, it was time for the test ride. Of course, I had to do another PBC video (it ends on Feb 15). It was -18°F at the start and rode all over the normal roads ending up in Fox at the intersection of the Steese and Elliot Highways. Then headed back to town. Still having clear, sunny days but in this case that means another cold spell. 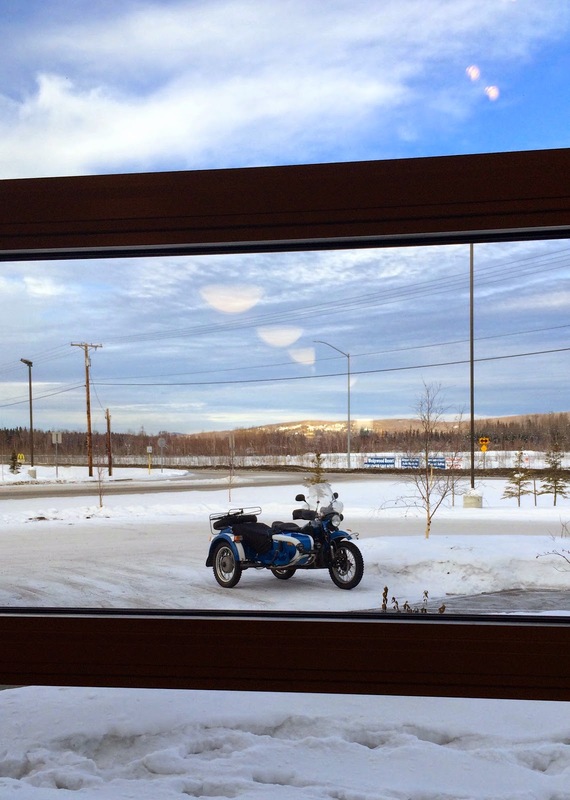 This morning, Yahoo weather was reporting -38°F for Fairbanks so I opted, yet again, to use the truck for my commute. I've still been submitting PBC videos by making multiple videos in a single day. For example, on Monday, I took a ride at noon and another in the evening as I headed out to the Silver Gulch. It was much colder in the Goldstream Valley so I stopped, ended one video and started up another one. Due to the temperature, I didn't stop and park at the Silver Gulch but headed home (via the scenic route) to the heated garage. I got a ride back out from BruceW, the Ural rider from Ketchikan, as he was borrowing his friends suv. A much warmer ride. The picture above is a test of another iPhone photography app called Hydra. It takes quite a few pictures in a row to generate the HDR photo. I'm not sure of the number but more than three. It has another interesting mode where it'll take a bunch of pictures (43 on the last test) and somehow morph them together for an 35 megapixel image. Electronic magic. I just heard back from Mickey, the Anchorage Ural dealer, and my parts have been mailed and should arrive in by the weekend. Time to get started on reassembly of the Ural. I hope I haven't lost any parts. The first PBC video is the continuation of PBC #38. From where I stopped in the Goldstream Valley when I noticed that it had cooled off. Still a nice moonlit night. One thing I "added" was slowing down the video as I was riding over the Trans-Alaska pipeline. The second video was just a ride out and around the north side of town that I rode after work. Just something to post on the PBC site. BTW, here is a link to the PBC site for anyone who is interested. The third video was a ride to fill up the rig. It had warmed up to -18°F by mid afternoon and with the bright sunshine, it was a really nice ride though it was starting to cool off by the time I got home. Plus, the heated grips on the Beemer are somewhat broken again. Also the right blinker and brake light on the sidecar. More broken wires. Friday Evening Update - The parts arrived from Ural in today's mail. One lifter assembly, one pushrod plus two valve cover gaskets. I had ordered the valve cover gaskets earlier to be delivered whenever the speedometer came in. They were "no charge" courtesy of Mickey. Tomorrow the Ural gets reassembled plus another oil change. On the BMW, there were two broken wires under the sidecar. The ground wire from the bike chassis to the sidecar body and the brake light wire. There is some flex necessary as the body rides on rubber rings suspending it from the frame. The bouncing just caused the wires to fatigue and fail. This isn't the first time they needed to be repaired. Intermittent electrical issues are the hardest but I probably just need to clean the connectors and put on some dielectric grease. The second video was recorded during my lunch break in a day full of meetings. Just a short ride out through Goldstream Valley and back to work on Ballaine Rd. The first Monday of the month the Airheads (aficionados of the BMW 247 aircooled engine) meet at the Silver Gulch for dinner. After riding out there, I noticed that it was -18°F plus I was 45 min early so I headed home. The trip home will be tomorrows video. The BMW is still a bit finicky at colder temperatures so I opted not to leave it out. BruceW, the Ural rider from Ketchikan, had offered a ride out to the Silver Gulch so I took him up on that.